Alexander Michailovich Grenkov was born Nov. 23, 1812 in the Russian province of Tambov. His parents raised him strictly and with fervent piety. Since he was of a priestly family, it was no surprise when he entered the Tambov theological seminary in 1830. He did well in his studies and was ranked among the top students. About a year before graduation Alexander became seriously ill. He promised that if God healed him, he would become a monk. Although his prayer was answered, Alexander seemed to forget his promise. After graduation from the seminary he took a position as tutor to the children of a certain landowner and remained with this family for a year and a half. After this he became a teacher at the local parochial school. One day in 1839 Alexander and a friend visited the famous hermit Father Hilarion to ask him what they should do with their lives. Alexander was surprised when he was told to go to the monastery of Optina Pustin, where they had great need of him. In September of that same year, however, he seemed to be prepared to continue with his teaching career. One night he was invited to spend a pleasant evening with some friends. His conversation was witty and brilliant, and all his jokes and puns were on the mark. Although his hosts were amused and impressed by him, Alexander was disgusted by his own frivolity. Perhaps his unfulfilled promise to become a monk weighed on his conscience. The next morning he quit his job and arrived at Optina in October of 1839. After a trial period he decided to remain in the monastery and dedicate his life to God. He received the monastic tonsure in 1842, and was given the name Ambrose in honor of Saint Ambrose of Milan (December 7). Ambrose knew the famous spiritual directors Elder Leonid and Elder Macarius. He was the cell attendant of Elder Macarius, who undoubtedly influenced the young monk’s spiritual development. Ordained as a priest in 1845, Father Ambrose’s reverence and piety in celebrating the divine services were noticed by the other monks. His health began to decline shortly afterward, and he had to ask to be relieved of all duties. In 1846 he was so ill that the Mystery of Holy Unction was administered to him. He bore his illness without complaint and slowly regained his strength. By 1848 he was able to walk with the aid of a cane. 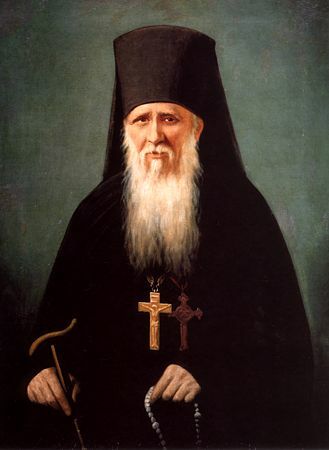 Father Ambrose began to help Elder Macarius with his correspondence and in preparing the Russian edition of Saint John Climacus’s LADDER OF DIVINE ASCENT, which was published by the monastery. When Father Macarius had to go to Moscow in 1852, he designated Father Ambrose to take his place until his return. Father Ambrose never gave his personal opinions when he was asked for advice, but always referred people to the writings of the Fathers. If someone did not understand the text he was given to read, Father Ambrose would explain it in simple terms. An average day in Saint Ambrose’s life began at 4 A.M. when his cell attendant came into his cell to read the morning Rule of prayer for him. After this he would wash and have some tea, then he would dictate replies to the many letters he received every day. Visitors would be lining up even as he was having breakfast. Sometimes he would take a break after two hours, but more often he would continue seeing people until noon when he had his lunch. After lunch he would go out into the next room and greet more visitors. People would call out questions and he would give an appropriate response. He took a short rest at 3 P.M. then talked to people until the evening. At 8 P.M. he had dinner then received more visitors until 11 P.M. At that hour the evening Rule of prayer was read, and Father Ambrose begged forgiveness of the brethren whom he may have offended by thought, word, or deed. After three or four hours of sleep it would all begin again. This routine would fatigue a strong man. It is remarkable that Saint Ambrose, who was often in poor health, was able to keep it up for so many years. From all over Russia, people flocked to the venerable Elder. The writer Tolstoy visited him on at least three occasions, and left impressed by the wisdom of the holy monk. Fyodor Dostoevsky came to Optina in 1878 after the death of his son Alyosha and was profoundly affected by his meeting with Saint Ambrose. The novelist used Father Ambrose as a model for Starets Zosima in The Brothers Karamazov. The saint founded Shamordino convent in 1884. This convent, which was near Optina, opened its doors to women who were poor, sickly, or even blind. Most convents were very poor and had to rely on the incomes of women who had a certain personal wealth in order to remain open. Saint Ambrose made it possible for any woman who wished to become a nun to follow this path of salvation. Shamordino began to decline after the death of the first abbess, Mother Sophia. Saint Ambrose went there in June 1890 to straighten out the convent’s affairs. He was unable to return to Optina due to illness, then winter made it impossible for him to travel. Father Ambrose continued to see visitors at Shamordino, even though his health continued to deteriorate in 1891. By September, it was clear that he had not long to live. He fell asleep in the Lord at 11:30 A.M. on the morning of October 10 1891. Throngs of people attended his funeral and also his burial at Optina. Fathers Joseph, Anthony, Benedict, and Anatole succeeded him as Elder until the monastery was closed after the Russian Revolution. Saint Ambrose was glorified in 1988 by the Patriarchate of Moscow as part of the Millennium celebration of the Baptism of Rus.